This question is what tempered my reading of The Irresistible Revolution by Shane Claiborne. 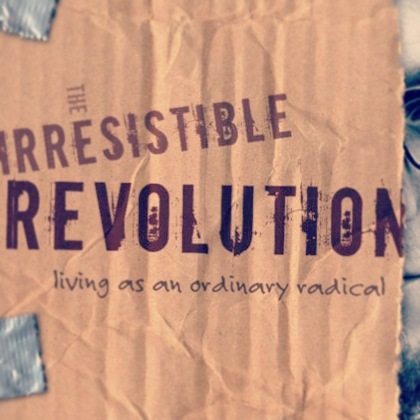 Jen Hatmaker in 7: An Experimental Mutiny Against Excess makes a brief mention of The Irresistible Revolution during her month of giving. Originally further down my summer reading list, I decided to bump up Claiborne's book to see what his book said. Having gone to Belmont, I had the privilege of hearing Shane Claiborne speak multiple times, and his book is just as convicting as his talks. It calls into question not just modes of operation of serving "the least of these", but the faint heartbeat in the modern American Church. It's not always a message I want to hear, but its a message I desperately need. Claiborne promotes a way of being Christ followers that stands in stark contrast to the removed existence of many churches. Frustrated by diminishing relevance in contemporary culture, the church has seemingly adjusted to its complacency. We've, for I include myself in this predicament, neglected the poor and the marginalized in our efforts to seek after God. Yet Jesus spent His time among the poor and the marginalized, so it is no wonder that we struggle to find meaning and relevance in our removed context. Before I review books, I have a tendency to see what others are saying about the book as well to make sure my thoughts are tempered with some sort of rationality, not just pure emotion. This book is definitely a decisive one. Yet wasn't Jesus' message, the Good News, a decisive message as well? I'm convinced in part that many of those who come down hard on this book for being "socialist" or "liberal" maybe are more taken aback by being confronted with places in their life that they haven't surrendered completely to Jesus? I definitely know I have been. I absolutely don't like being reminded that sitting in my comfortable room, reading on my laptop or iPhone puts me in a social class far above a huge portion of the world in wealth. While I am considerably blessed, the kingdom of God doesn't have exemptions like a tax code. To follow Jesus means everyone. You, me, the butcher, the baker, the candlestick maker, we're all compelled by the Gospel to serve the least of these. I thought about, and erased, a few attempts to qualify or justify The Irresistible Revolution, but in reality I would be doing an injustice to the message of the book. Maybe, just maybe, Jesus meant what he said, regardless of how comfortable I find the message.